Warner Steel Sales opened its doors in July of 1995. The goal was to provide Indianapolis with a shop that individuals and businesses could purchase structural steel products in smaller quantities without the penalty of a minimum order. Warner Steel also set itself apart from other steel companies in the area by specializing in Cut-to-Size material, pricing the material by the foot, and focusing on timely, same day service. Now, 20 years later, those goals are still the same. Although we have grown to allow us the opportunity to sell steel in larger quantities and have added other products (aluminum) to our inventory line, our main focus is to still be the leader in Indy for providing smaller, cut-to-size orders. In 2006, Warner Steel purchased 2.5 acres of land at 2623 E. Raymond St. With two existing 7600 sq foot buildings, this property will allow Warner Steel to grow and expand its services to Indianapolis customers. In 2017, a location in Martinsville opened allowing Warner Steel to service more customers in southern Indiana. With the addition of the press brake and the plasma cutter, Warner Steel is offering more services to help our customers complete their projects. So... if you need steel or aluminum in small or large quantities, press breaking, or plasma cutting, please allow us to fulfill your needs. Get your project started by placing an order over the phone, sending an email, or stopping by to see what we offer. Follow us on social media to see whats happening in the shop! We post frequent updates, drop shop deals, and projects we've done on Facebook. Follow us there for the day to day happenings around Warner Steel Indy or Warner Steel South! Mike and his wife, Amy, opened the business in 1995. For the first few years, Mike ran the shop while Amy drove the delivery truck. In 1999, the first WSS employee was added, which allowed Amy to leave and pursue her career working in the kid's school corporation. Mike spends his day managing the south store in Martinsville. He still visits the Indy shop a few times a week but has handed the day-to-day operations over to the next generation of Warner's...his three kids: Jake, Ali, and Brock. Mike and Amy spend their free time relaxing on the water of their Martinsville lake community. They also enjoy trying new restaurants and visiting antique shops. Jake has been at Warner Steel Sales since 2010 and loves cutting steel to size. 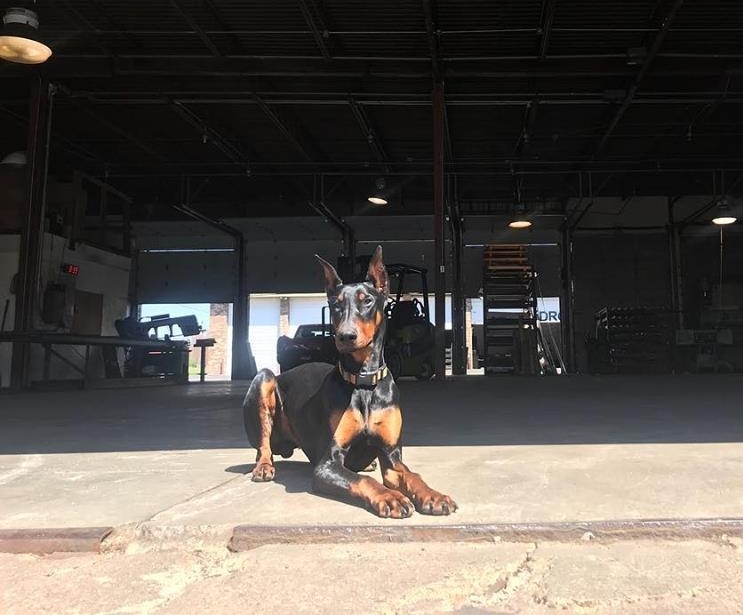 Keeping the shop clean, shelves stocked, and orders organized are some of his daily responsibilities. Whether you are fixing a trailer, building a sculpture, or renovating a home, Jake will be happy to assist you. He lives on the near east side with his partner, Jen, and their fur babies. Jake enjoys cross stitching, gardening, and going for walks with his pups. You can often find Jake and Jen at student art shows, First Friday's, and University Park downtown. The tape measure on his forearm says "love beyond measure" and that's what he aims to do. Joining the company in summer of 2016, Ali took over all day to day accounting responsibilities and office ordering. She is also the one answering the phone and taking orders. If you come in around lunch time and the office smells great, it's most likely her cooking, as she makes lunch 2-3x a week for the employees. In her free time, Ali loves her dogs and trains them to compete in agility. You may hear her on an occasional Saturday at the Indy shop practicing with her dogs behind the drops. She also enjoys hiking, kayaking, and all types of adventures. Brock spends most of his time running the plasma table and enjoys helping around the shop while keeping the crew entertained. After a few years of being in and out of the shop during school, Brock has been fulltime since May of 2017. When away from the shop, Brock enjoys hanging out with his wife, Danielle, and their two dogs and dozen chickens at their home in nearby Garfield Park. He likes to fill his free time with Brazilian Jiu Jitsu, home projects, and exploring the city. Ali's Australian Shepherd that is a part time shop dog, part time award wining agility dog.